The ruling Samajwadi Party (SP) in Uttar Pradesh split on Friday between party chief Mulayam Singh Yadav and his son and Chief Minister Akhilesh Yadav who was expelled from the party following a rift over the selection of candidates for the assembly elections due next early next year.Also expelled for alleged anti-party activities was Akhilesh-backer and party General Secretary Ram Gopal Yadav who had earlier in the day called a national convention of the Samajwadi Party on Sunday after Mulayam Singh finalised his list of candidates for the polls in the politically most crucial state.The Akhilesh faction with Ram Gopal Yadav's support came up with a separate list of candidates, sparking crisis in the Yadav family and the party as its five year rule in the state draws to a close.Asserting his authority, Mulayam Singh said only he, as the party chief, had the right to call a national council meet and nobody else could do so. "We are expelling both Akhilesh and Ram Gopal from the party for six years. 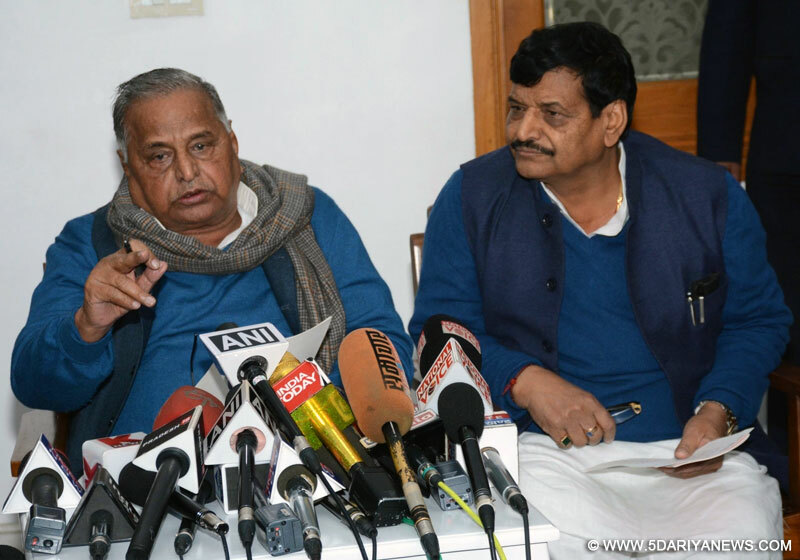 Both of them showed indiscipline...this is to send a strong message that indiscipline won't be tolerated," Mulayam Singh told reporters at a hurriedly convened presser with brother Shivpal Yadav sitting by his side.The SP chief said Akhilesh Yadav is no longer the Chief Minister and the party would decide who would succeed his 43-year-old son. "I made Akhilesh the chief minister. Now he does not even consult me," said the senior Yadav, adding he was sacking the son to "save the party".But a defiant Akhilesh Yadav showed no signs of quitting, throwing up some possible political scenarios in the poll-bound state. These include the imposition of President's Rule till assembly elections are held; Akhilesh Yadav asked to prove majority in the assembly if he continues to stay defiant. If he loses, the Mulayam faction may be asked to elect a new Chief Minister.Minutes after the expulsion, hundreds of Akhilesh supporters, waving banners and posters with pictures of the chief minister, gathered outside his 5, Kalidas Marg residence here to show their support to him. They accused the party chief of doing "injustice". Returning the fire, Ram Gopal Yadav refused to accept the expulsion and defended his decision to call an emergency convention of the party. "The action taken against me is unconstitutional. He (Mulayam Singh) acted even before we could respond to the show cause notice (issued earlier)," he told the media.He said they would go ahead with the party convention on Sunday to let the facts come clear.The Yadav patriarch came down heavily on Ram Gopal Yadav and accused him of damaging Akhilesh's future prospects apart from weakening the party through his activities. "Ram Gopal has weakened the party. He has no right to call party's national convention. He is also damaging Akhilesh's political future, and Akhilesh is not understanding this," Mulayam Singh said.Asked if he would reconsider his decision vis-a-vis Akhilesh if his son apologised to him, Mulayam Singh said he would "consider if that happens". "Why would Akhilesh apologise?...We'll see if he does," Mulayam said.